You can't make this stuff up. Keep it going! It's just too funny! Isn't it easier in most cases to adjust the projection by altering the fingerboard? Maybe easier than a neck reset, but adding a wedge or changing the fingerboard alters the relative thickness of the neck/fingerboard combination. I think I understand jerry's idea, it maintains a constant relative to the lower bouts. So you don't have to adjust yourself so much when changing instruments. Am I right? As much as is possible. To be clear this is not my idea, although after using it for 25 years and having the makers in my workshop use it I do believe it has the most consistent outcome. I should point out that the difference between what Nate is advocating and what I/Rene' are advocating is not much different. 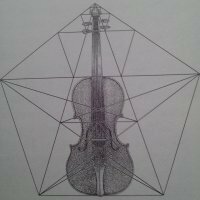 In a cello that is not distorted, there is no difference, and in a cello that is distorted, the difference is half of the distortion amount. Nate, please tell me if I am misrepresenting your position. I don't like wedges, but a slight thinning in the right place makes a big difference in projection. I want to make a jig to sort out all of the variables and hopefully avoid all these problems. On another thread recently we couldn't even agree on what caused what. I gave up arguing my point because it was getting too hot in there. Really good, well drawn diagrams would help with the explanations. I've never seen a cellist hold (or index) an instrument by the edges of the top with their legs Jerry, but that's what your fancy stick does. We could measure the difference in rib heights, and shim the stick to compensate (although I'm sure you'd use some fancy screw device rather than a shim). There is an idea, if we can come to an agreement on where we should align the neck, a couple of spool clamps at the appropriate point on the bouts with a bar spanning them could be adjusted with thumb screws to exactly what is required. Lets get Norfleet to build it. For those who don't know who Mark Norfleet is, or what Jerry and I have been teasing around about, Mark is a really brilliant fiddle maintenance, sound adjustment, and restorer guy in Ann Arbor, with exceptional mechanical intuition skills, who is very capable of doing things either by hand or machine, depending on which turns out to be a best fit. He is also somewhat ( ) reclusive. I was surprised to see him post yesterday.... maybe the fourth post in four years? No, I can't give out his contact information, because he has asked me not to. If someone gets bugged with enough phone calls and emails, there is no time left to work on fiddles. I regularly do this when setting necks on old instruments (or adding a wedge), but take the measurement at the top block measuring up from the back plate. It's helpful when the edge thicknesses isn't the same on both sides of the neck and/or rib heights are different, which is often the case. Measuring the tilt at the bridge position is, for me, also important. Jerry's "poirette stick" is handy, but I feel has to be used in conjunction with other checks. I agree with what's been said about bow clearance and, as importantly, the players ability to get over the shoulder with comfort. I hope you didn't have a problem. So as regards the getting around the shoulder issue the biggest part of this is the total apuis (overstand) height. The poiriette will help by raising the overstand on the treble side in relation to everything else but simply going for a generally higher apuis will help get the left hand over the shoulder of the cello regardless of everything else. Since string angle doesn't seem to make that much difference (according to Don Noon) and/or the saddle can be raised to compensate it would seem that raising the apuis in general would be a viable choice. I am aware that some of the NY makers are using apuis of 24/25 or even higher and wonder what people think of this. The one objection that comes to my mind is that a significantly higher apuis makes it slightly more likely that the pitch will drop later but there are ways to ameliorate that. This is my current project, think I see why he is having so much trouble with playing the A string . This topic coming up now is very fortuitous in that I will have to make some decisions on my approach to this soon. The mock up on the existing neck set is ala Weisshauer. Those who don't understand what this is, the lower ruler represents the poiriette and the upper ruler represents the line through the A-C angle. Thanks to an industrious "repairperson" in the past, then neck is NOT coming out without a doing a neck graft. Customer is blowing their whole wad on belly work so I'm figuring on putting a shim on the fingerboard and planing to the right angle, specs. Jerry, talked to Matt N. about this and he showed my your lower bout stick method. I was just dealing with the bridge, maybe need to check the body twist though is haven't noticed much yet. Maybe I'll make your jig, was actually thinking about it when Matt showed me, but figured if it was needed, you guys would have already done it. Something that I don't understand, Weisshauer mentions a 3-4mm poiriette (he's calling it tilt), but at what point? That's a lot. Neck root, bridge? Oh boy, a lot to unpack there. 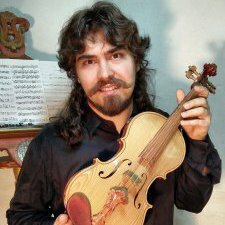 I will have a look a Weisshaar more closely, but I believe he is measuring from the bottom of the strings, not the fingerboard. So we are talking about different numbers. The cello in the picture looks pretty bad. A good shorthand is to look down the fingerboard and visually line up the corners of the fingerboard to the top edge on both sides of the saddle. If you do that you will see that the a side is considerably lower than the c side....this looks tough to play. I believe a reasonable repair would be to add a shim under the board that would be thick under the a and be planed to be non existant under the c. Then plane the profile of the top of the finderboard to take the most from the c side and nothing under the a. In essence, making the board thicker under the a and thinner under the c, getting the neck tilt you want without changing the neck thickness. Good to hear, that's just what I was planning, and in addition, I need to plane the shim for the right projection too. It's a little high now, and I'm thinking the the shim will be thickest at the nut, A side and thin at the neck root A side and thinner yet at the nut on the C side and non existent at the root on the C side. Or, maybe take off some appui on the C side and make the C nut part non existent....... Anyhow, I get it. Thanks. the right projection too. It's a little high now. This is my current project, think I see why he is having so much trouble with playing the A string . This topic coming up now is very fortuitous in that I will have to make some decisions on my approach to this soon. The mock up on the existing neck set is ala Weisshauer. Those who don't understand what this is, the lower ruler represents the poiriette and the upper ruler represents the line through the A-C angle. What you have shown is not representative of the way cello necks were done at the Weisshaar shop. The tilt on a cello neck would have gone in the opposite direction. That's not to claim that it couldn't have been done there that way. Weisshaar trained a lot of people, and some were pretty green when they started there, and made some mistakes. I believe Jeff was saying the mockup he did in the picture is ala the Weisshaar book, not the set. I'm not sure I'm following you. 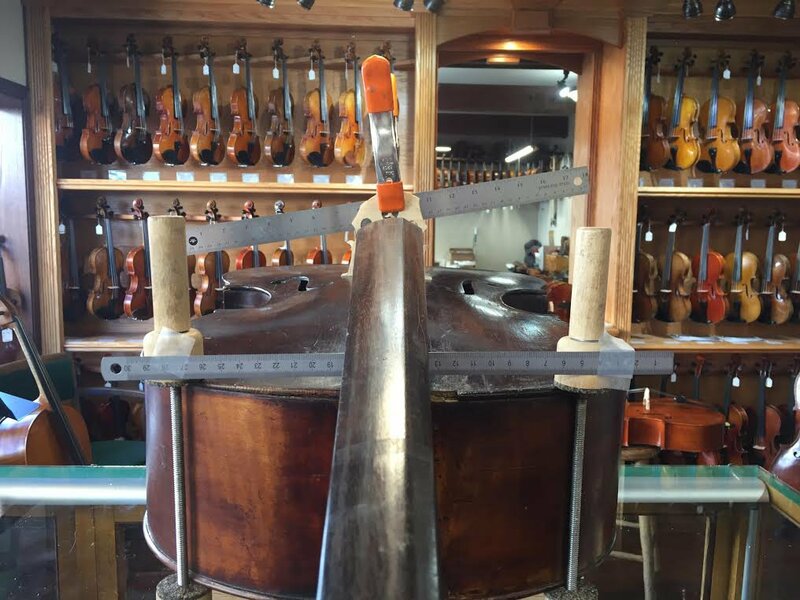 The tilt on a cello neck in the Weisshaar shop would have been in the opposite direction. Perhaps the Weisshaar book didn't adequately cover all the differences between violins and cellos? I don't know, since I have never read the Weisshaar book cover-to-cover, and don't even own the book. I just worked there. I am probably just confusing things. I think the only thing Jeff was referencing about Weisshaar was the way he clamped the ruler to the bridge, so we had a base line to compare. I do not think he meant anyone at Weisshaar was in anyway responsible for the neck on that cello. I can't be sure, since I have already confessed that Hans Weisshaar took on the training of many less-experienced people, including me. Mistakes were made by trainees. Didn't you need to audition in the Francais/Morel shop for something like one or two weeks, before you were hired? Hans wasn't that careful, which had both its pluses and minuses. Someone might look really good on day one, and never improve from there. Another might be a total failure on day one, and then soar. David, Jerry is right, I mocked this up like Weisshauer did in the book showing the "before" pic, not the corrected neckset. I haven't worked on the neck at all yet because (as Jacob pointed out) everything will be a little different when the belly goes back on, especially because I need to do some corrective work on the sagging BB area, along with BB crack to redo, cleat etc. I did this to show myself (and the customer) WHY they were having so much trouble. Sorry to confuse. Yes, all will change some after the belly work is done. However, I'm now thinking you are refering to a "reverse" NY neck set? What is the opposite of "New York"?